Leading commercial variety with yellow-green skin and creamy flesh. This is a winter pear that should be ripened on the tree to gain its full flavor. The suggested pollinizer is Bartlett, but Clapp's Favorite, Red Bartlett, Seckel, or Bosc can also be used. Introduced nearly 200 years ago, this remains the most popular variety of pear, for both commercial orchards and home gardeners. The trees bear early and regularly. Fruits are large, yellow tinted, firm and sweet. Excellent for canning or eating fresh. Ripens mid-to late September. Bartlett is partially self-fruitful and is also pollinated by Clapp's Favorite, Red Bartlett, Anjou and Bosc. Hardy to -20F (-28.8C) . Though the trees are a bit slower coming into bearing than Bartlett, once established, these are among the most fruitful of pear varieties. Fruits are large, cinnamon-russet in color and disctinctive in taste. Excellent market garden variety. Ripens late October. The suggested pollinizer is Bartlett, but Clapp's Favorite, Red Bartlett, Seckel, Anjou can be used as well. Hardy to -20F (-28.8C). Large lemon yellow fruits with a red blush. An excellent choice for shipping, as the fruits are sweetest when picked green and allowed to ripen off the tree. Does not keep well. Ripens mid August. Can be pollinated by Bartlett, Red Bartlett, Seckel, Anjou and Bosc. A favorite dessert pear, Comice has yellow-green skin, sometimes blushed red, and a sweet juicy taste. New variety from East Malling with medium sized fruit with white crisp flesh. Trees are vigorous and hardy. Fruits are small, fine grained juicy and sweet. Skin is russet with some red blush. Popular for canning whole. Can be pollinated with Clapp's Favorite, Anjou and Bosc. Ripens late August. Narrow full branching tree with masses of white blooms in the spring. Leaves are leathery and deep green and turn a gorgeous orange-red in the autumn. Makes a pretty street or speciment tree. Commonly used as rootstock for other pear varieties due to its resistance to fireblight and pear decline. Hardy to -20F (-28.8C); height: 20ft. Callery Pear cultivar with white spring blooms, strong central trunk and open growth habit. Good variety for windy areas. Hardy to -30F (-34.4C); height: 25ft. 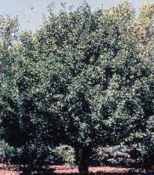 A very popular cultivar of the Callery Pear, this vigorous, fast growing tree has white spring blooms and bright bronze-red foliage in the fall. Hardy to -30F (-34.4C); height: 25ft. Cultivar of Callery Pear with white spring blooms and purple-red fall coloring. Better branch angles than 'Bradford' makes this a good choice for areas prone to snow and ice. Hardy to -30F (-34.4C); height: 25ft. Used most often as a rootstock for other pears, this winter hardy species is vigorous and disease resistant. Hardy to -30F (-34.4C); height: 25ft.